Can a Felon Become a Pastor? As a result of their incarceration and having time to reflect on their mistakes, felons may develop a stronger faith. This may lead them into planning a career in the religious field after their release. For many of those this might mean becoming a pastor. After all, they often must look for a different job upon their return to society, which may also include getting additional education. 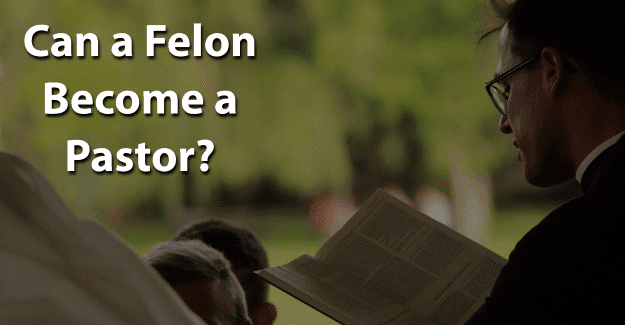 This blog post will address the issue of whether or not a felon can become a pastor. What Education/Training Does a Pastor Need? How Much Does a Pastor Earn? A pastor (often called a minister) is a person that has been ordained to spread the Word of God. He or she serves people and leads them to a union with God. A pastor does this by teaching people about their religion, guiding them, and offering spiritual care. In order to become a pastor, most religious denominations have specific requirements, which is typically a master of divinity degree from a school of theology or a seminary. The final step in becoming a pastor is training in supervised ministry. Some denominations begin with ordination as a deacon before becoming a pastor, a designation to baptize or conduct a funeral. Some religious denominations make a distinction between an ordained or licensed pastor. Generally, religious denominations consider an ordained pastor to be a permanent clergy member. Ordination allows a pastor to perform church rites such as baptisms, marriages, and funerals. A licensed pastor is usually authorized to perform some – but not all – pastoral duties. Each state decides on the requirements to become a licensed pastor, but typically someone must be at least 18 years old to be eligible for licensing as a pastor. According to the U.S. Bureau of Labor Statistics, there are approximately 49,320 pastors in the United States. The median salary for a pastor was $45,720 in 2011. The median salary is that level for which half earn more and half less. Experience, location, and religious denomination will make a difference in the salary of a pastor. Those serving on the East or West coast tend to earn more than a pastor working elsewhere. The need for pastors is estimated have a growth rate of 6% between 2016 and 2026, which is about average. Criminal activity in one’s background does not automatically disqualify an applicant for the ministry. Each denomination establishes its own criteria related to felony convictions. This is because of the separation of church and state. It is best that a felon meet with a vocation director for the particular religious denomination that he or she is considering and be honest, even about things that will not come up in a required criminal background check. It is better to tell them than for them to discover offenses on their own. One significant legal risk for churches of most denominations is called negligent selection. This is a failure to use reasonable selection of a pastoral candidate or other church worker having frequent contact with members of the congregation, especially minors. Extensive questions on an application and a more formal background check are used to help deal with this. Also, criminal background checks are considered together with an assessment of the applicant’s motivation. Those who do not fulfill these entrance requirements of the seminary may not be admitted. A psychological assessment is often an essential part of the admission procedure. In order to be successful in their pursuit of becoming a pastor, it is essential for felons to be honest about their background. It is important to be honest in filling out any licensing application. If a felony isn’t disclosed but is found while doing a background check, this constitutes as fraud which is a punishable crime. This would require an attorney and could result in their being sent back to prison. They are already working with the often negative perceptions of being dishonest, untrustworthy, and unwilling or unable to follow directions from authority figures. Having their record expunged can give them the chance needed to begin with a clean record and succeed in becoming a pastor. Expunging a criminal record allows anyone to honestly state on an application that he or she has not been convicted of a crime. It is a big challenge, but it might be worth it for a felon wanting to become a pastor. Giving him or herself the best chance for success by having his record expunged and also documenting any training programs or additional education could make the essential difference. Having support from family, friends, or religious advisors can make a huge difference. A felon doesn’t have to be defined by his or her crime. We are not defined by our mistakes but by how we recover from them. He or she can begin again and live an honest life no matter how difficult it might seem. What do you think about this blog post? Have you or someone you know been in the situation of trying to become a pastor with a felony? What was that like for him or her, and how did he or she achieve success? Please tell us in the comments below.